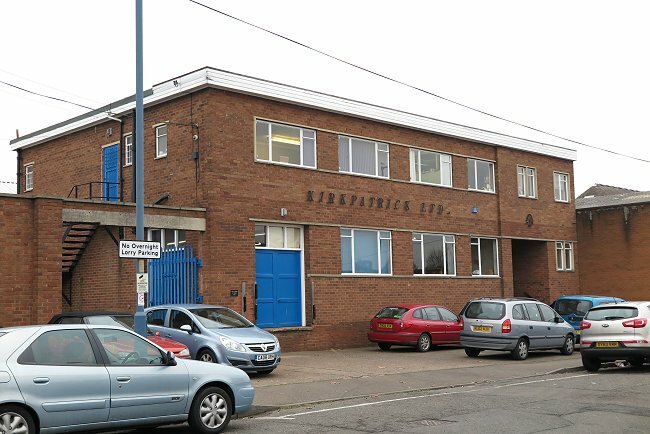 Walsall’s longest surviving foundry must be Kirkpatrick’s, in Frederick Street, and across the road in Charles Street. It has been in operation since 1855. In the 1820s, brothers John and Thomas Kirkpatrick moved from their home in Kirkcudbrightshire and settled in Walsall. In 1832 they were joined by their younger brother William, born in 1817. He became an ironfounder, and in 1855 set himself up in business. The foundry was originally part of the Frederick Street site, but is now located across the road in Charles Street, where it has been since the 1930s or 40s. 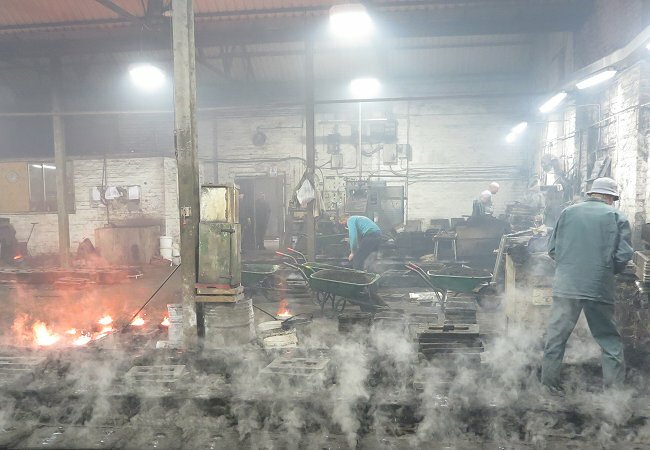 It has a modern electric induction furnace, and still produces large amounts of high quality black iron door and window furniture. 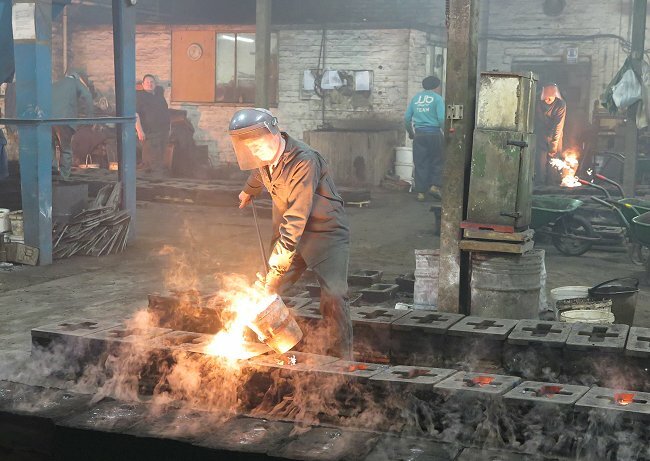 The firm employs around 70 people and exports products throughout the world. 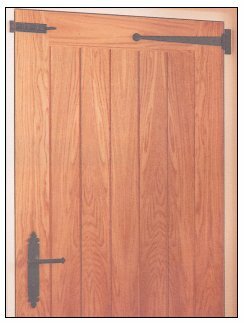 William Kirkpatrick began producing Gothic and Medieval style iron work and door furniture, which was very popular at the time. He had a strict Covenanting upbringing and became involved in the church, and later joined the Walsall School Board. In 1877 he was elected to Walsall Council, and became a Justice of the Peace. In 1886 he became Mayor, a post he held until his death in 1887. After his death, William was succeeded in the business by his son Vincent who oversaw the incorporation of the firm in 1901. 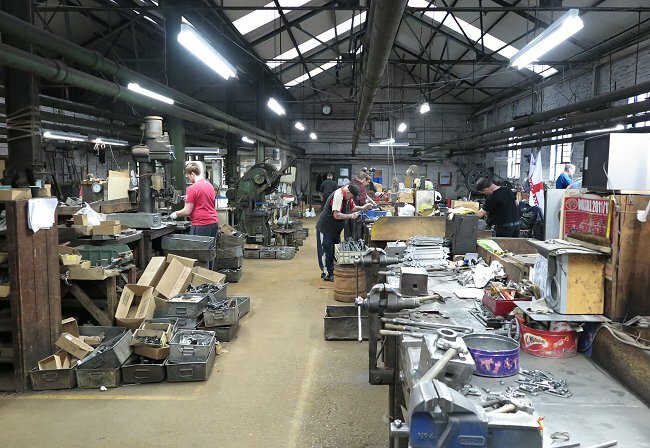 Kirkpatrick Limited became well known as a manufacturer of a vast range of high quality builders’ ironmongery, much of which is still made today. 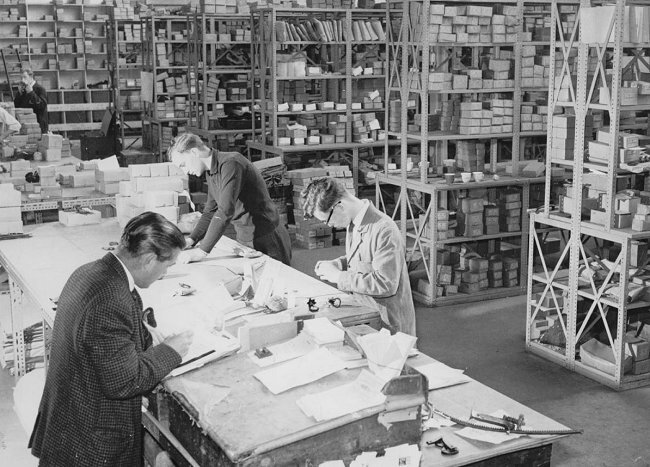 During both world wars the firm concentrated on items for the war effort, including thousands of fittings for ammunition and storage boxes. 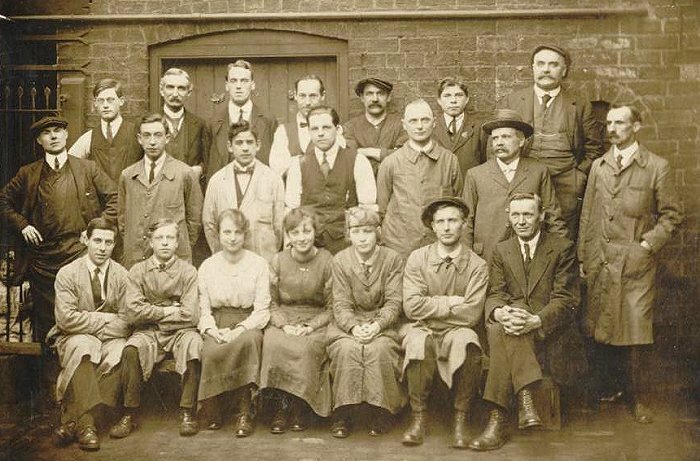 An early photograph of some of the staff. Courtesy of Stephen Preston. Back row left to right: C. Skett, I. Evans, A. Oakley, J. Carter, T. Cooper, T. Kelly, and J. Foxley. Front row left to right: G. E. Moss, E. Booker, M. Kirk, G. Walker, A. Dkins, W. Thornton and A. J. Philpot. 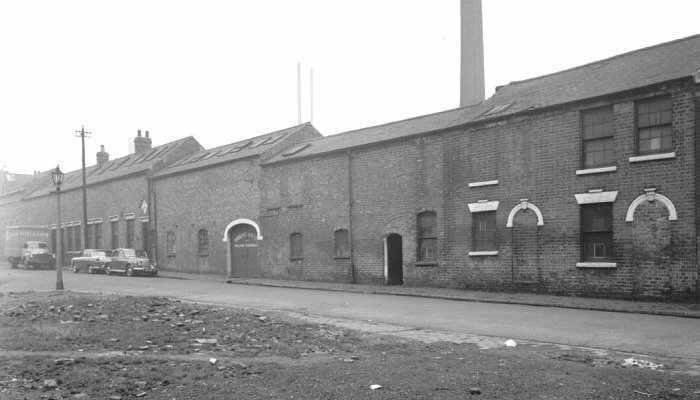 An old view of the Frederick Street factory. Courtesy of Stephen Preston. A busy day in the warehouse. Courtesy of Stephen Preston. An old company letterhead bearing the firm's motto - I mac siccar - I make certain. 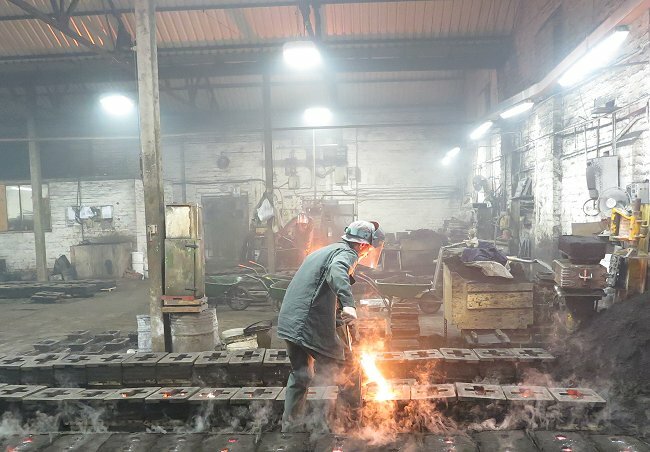 Over the years the firm has produced almost every kind of builders' ironmongery. 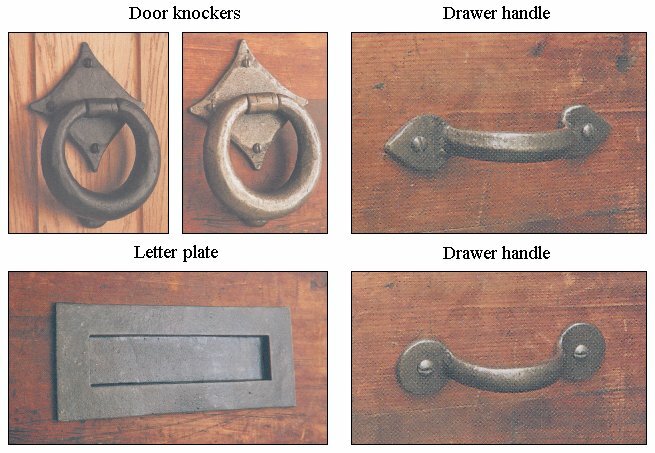 The vast range of products has included Gothic handles and latch furniture, lever handles, door pulls, bolts, chains, letter plates, postal handles, door knobs, sash handles, lifts and pivots, thumb screws, cupboard knobs and buttons, hasps and staples, locking bars, hinges, cleat hooks, refrigerator fittings, casement stays and fasteners, quadrant stays, hat and coat hooks, handrail brackets, wire strainers, trestle hinges, pipe clips, stair treads, pulleys, bucket brackets, ventilators, spanners, rowlocks, blind fittings, manger rings, stable fittings, latches, and much more. Many of the items are still produced today. 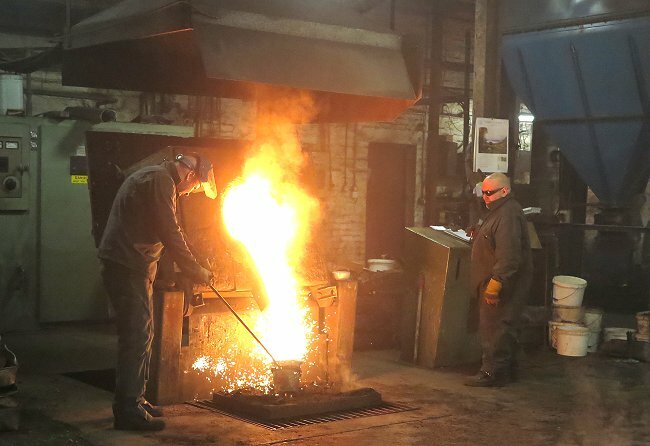 For many years the foundry would cast almost any small item for a customer, but as the demand for the firm’s high quality builders’ ironmongery grew, production was concentrated in this area. The firm is a good employer, the skilled workforce has included members of families who have worked here for several generations. 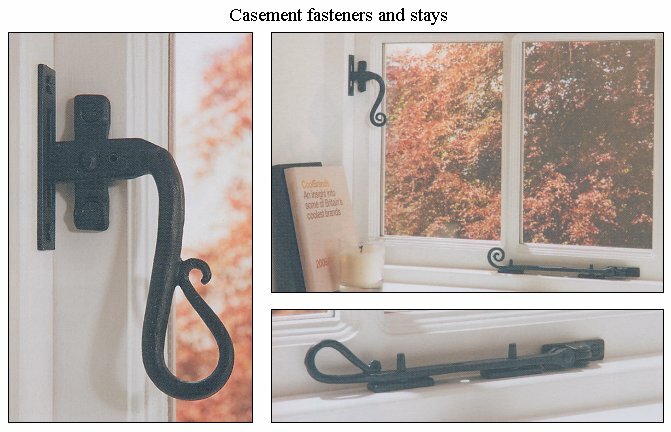 The products are still in great demand today, and Kirkpatrick is now the only manufacturer in the country of traditional black ironmongery. Their products are handmade and British from start to finish. Filling ladles. Courtesy of Stephen Preston. We now live in a throw-away society, and are used to buying products that all too soon reach the end of their useful life. 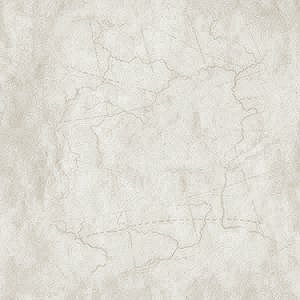 Kirkpatrick's products are different, they really do last a lifetime. The company sometimes receives items for repair, which turn out to be cheap inferior foreign copies, not made to Kirkpatrick's high standard. The company even received a foreign copy of its own catalogue in the post, advertising what were in fact, second-rate copies of the firm's products. There was a time, not that long ago, when we were proud of our home-made products, carrying the 'Made in Britain' label. Kirkpatrick's products are something that we can still be justifiably proud of today. 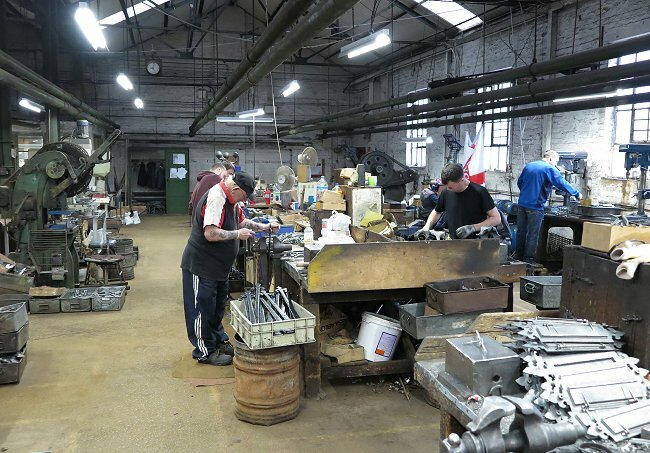 We not only make the best ironmongery, but make it here in Walsall, in the heart of the Black Country. The company's offices in Frederick Street. 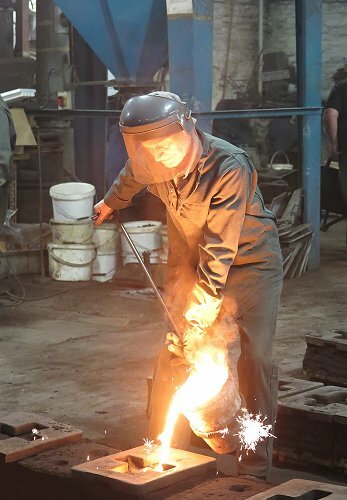 Filling a ladle with molten metal from the furnace. 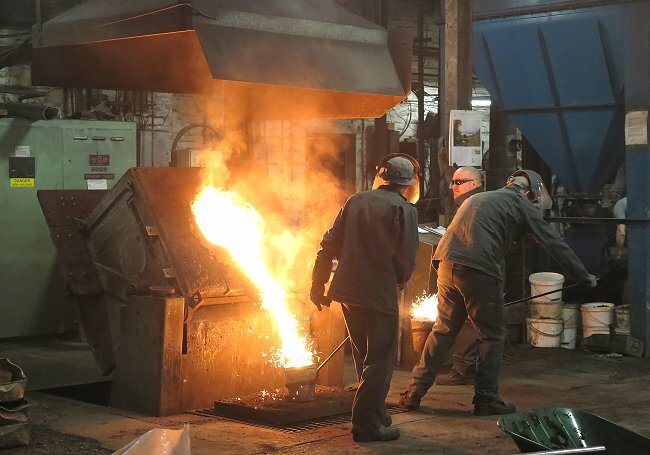 Another view of the furnace as two of the moulders fill their ladles. 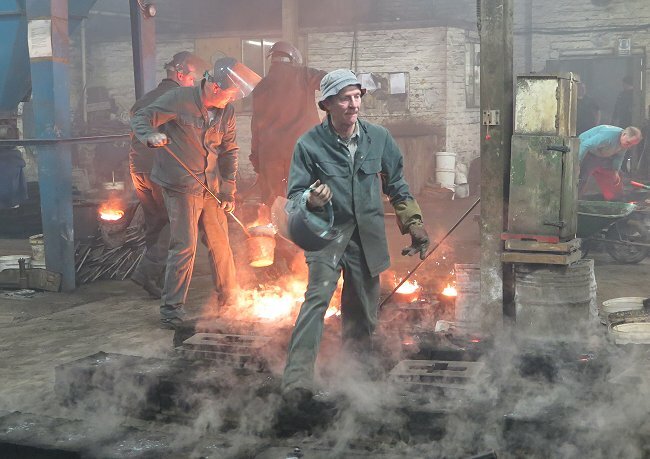 Casting, a busy time in the foundry. 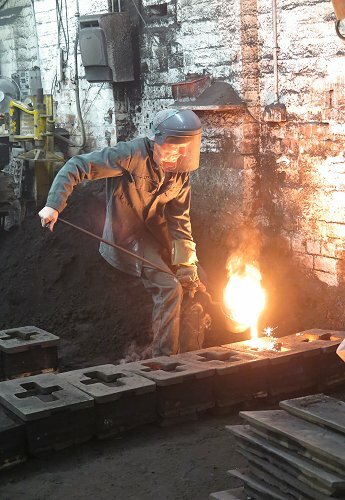 Filling some of the moulds with molten metal. Another view of one of the moulders at work. 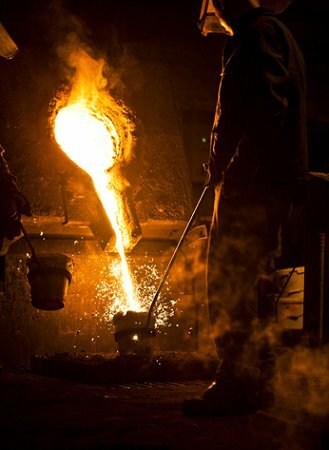 Casting is always a spectacular sight. 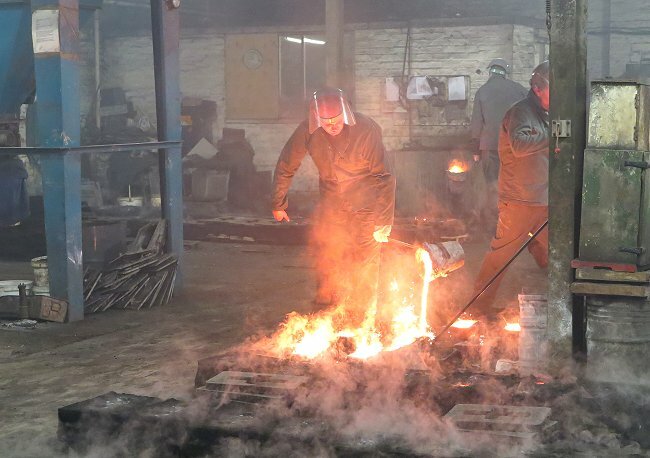 The castings begin to cool. The end of the morning's casting. Finishing off, and assembling some of the many products. Another view of the assembly area. 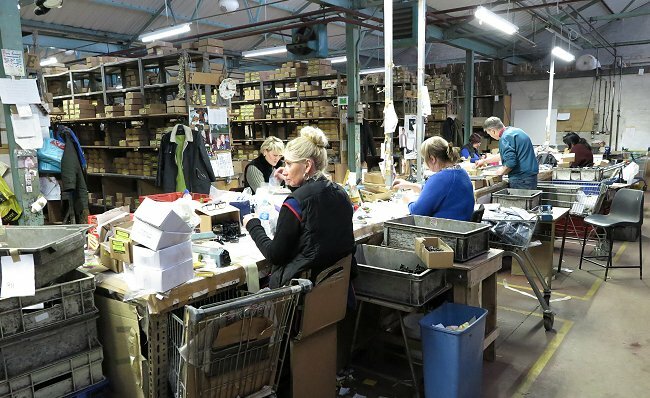 A corner of the packing department from where products are sent all over the world. 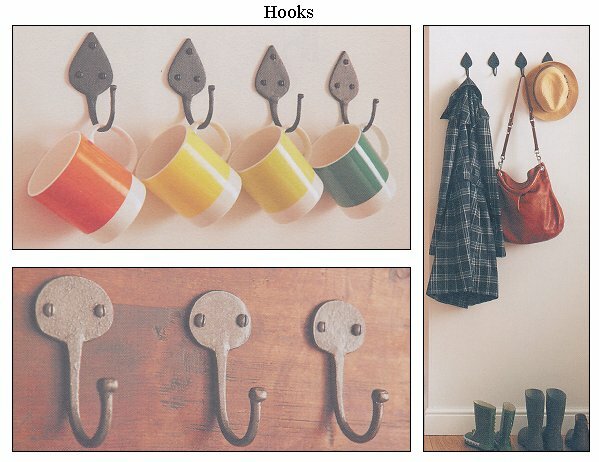 Fittings for doors, cupboards, gates, and drawers etc. Fittings for casements, sashes, skylights, fanlights, etc.